For most, grilling is just one of the ways that they cook their food. They consider it no different than baking, broiling, or frying food. It is simply just a way to prepare a meal. However, there are those who take a great deal of pride in their barbecuing. It is not just a means to prepare food, but is an art form. There is a specific amount of seasoning that has to be applied, the food needs to be marinated for a certain period of time, and the amount of heat applied to the food has to be just right. They have turned this into a masterpiece by the time the meal is finished. What many home chefs have come to understand is that there is a lot more to barbecuing than simply putting your food over a fire and letting it cook. A great piece of meat, vegetable, or other dish needs to be prepared, and cooked in such a way that it ensures that it has the very best taste. While seasonings and marinades are quite important, the truth is that the grill that is used plays as much of a role in the success and taste of your food. It does not matter whether you are talking about a gas grill, charcoal, or some other kind of style, the grill can play the most pivotal role in how tasty and juicy your food is, and this is why so many have turned to the smoke grill that is their choice. The smoke grill, also referred to as the kamado grill, provides one of the absolute best tastes that you can possibly have when barbecuing your food. By using the right grill, you can add a perfect smoky flavor to your meat, vegetables, or other dish, making the taste as enjoyable as one could imagine. Some of you may be quite unfamiliar with the kamado grill. Surprisingly, this grill traces its roots back over 3000 years to ancient China. The earliest cooking pots were made of clay, and found in this Asian nation millennium ago. While these vessels have evolved over the centuries, the use of clay or some other similar material has remained a standard in terms of cooking vessels. This eventually developed into the modern ceramics, which is what is the base for the vast majority of kamado grills. It is interesting that many of these grills have the same appearance as those you would’ve found 2000 years ago. The primary difference that is seen is in the additional features to the grill, putting such things as dampeners and draft doors, which help to improve the heat efficiency of the grill. What Makes This Grill Stand Out from Traditional Grills? 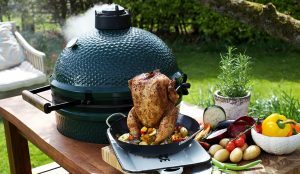 Who Are Kamado Grills For? The Grills Forever team fell in love with the Kamado Grill the first time we used it, so we decided to try dozens more. This ancient grilling technique just gave us that juicy and smoky flavor we couldn’t find anywhere else. 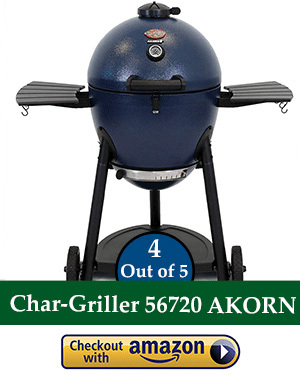 We love using grills as much as you do, and after 12 combined hours of researching and using these grills, we’ve come to the conclusion that the Char-Griller 06620 Akorn Kamado Kooker is the best Kamado grill out there. It satisfied almost all of 49 criteria identified by Grills Fowrever, including price, cooking space, heat retention, ease of use, and overall food flavor. The Best Product to Buy! This unit has great taste, excellent quality and design, and versatility. 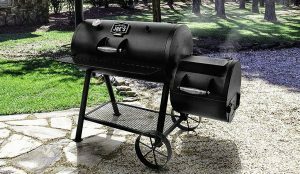 This grill and smoker combination looks great and combines multiple ideal qualities in one package! Buy it from Amazon! ($298.00) Prices are accurate as of 23 Apr 2019 at 10:40 PM . Product Prices and availability are subject to change. Any price and availability information displayed on Amazon at the time of purchase will apply to the purchase of any products. With a large 314 square in cooking space with an extra warming rack of 133 square inches, this Kamado BBQ grill is a tough one to beat. We were amazed with its durable build and versatility; it comes with plenty of features that make heat easy to distribute and control. This grill is made of a ceramic-coated interior that provides insulation through its triple-wall design. With this grill, we found no problem with monitoring the temperature in getting evenly-cooked meat. It’s also fairly easy to clean, so it’s ready to use for your next BBQ party! The only downside is that it doesn’t come with a warranty. Made of ceramic material, this unit has amazing insulation! Providing a heat gauge for your convenience, you’ll find that optimal temperature control is just within reach. Buy it from Amazon! ($725.50) Prices are accurate as of 23 Apr 2019 at 10:40 PM . Product Prices and availability are subject to change. Any price and availability information displayed on Amazon at the time of purchase will apply to the purchase of any products. 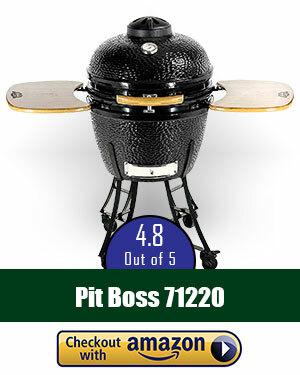 Out of our criteria, this Kamado grill checked 17 of the marks, which makes it land on second place. It still comes with amazing features, such as a wide cooking area of 567 square inches and a grill that can reach temperatures up to 700 degrees F. Though quite expensive as compared to the top choice, this grill displayed potential in terms of durability; it’s made of high-grade ceramic material that helps with insulation, making sure your meats and vegetables are cooked to perfection every time. This is a lightweight model made from cast iron and ceramic. At a low price of only $320, this unit is great for any newcomer! This grill is easy to use and to maintain! Buy it from Amazon! ($138.00) Prices are accurate as of 23 Apr 2019 at 10:40 PM . Product Prices and availability are subject to change. Any price and availability information displayed on Amazon at the time of purchase will apply to the purchase of any products. We ranked this Kamado grill third because for its affordable price, it still came with features that you’d find in reputable grill brands. At only $320, this 153-square-inch ceramic Kamado grill is the ideal choice for intimate BBQ cookouts. Despite its small size, it can still reach temperatures as high as 700 degrees F through its insulated design. With this grill, you won’t have to wait too long to use it – it’ll start with just one press of the button! After grilling, you can simply dump the pan during clean up. What’s even better is that it’s light in weight, so you won’t have a problem moving it around. However, this grill isn’t as durable as compared to our other picks. Thick Walls and Lifetime Warrenty! This unit has amazing temperature control as well as a great design and build! Priced around $1,500, this unit offers a lifetime warranty, quick startup time, and portability! We had a hard time looking for any flaws about this product because it satisfied most of our criteria, and offered some of the best features such as a lifetime warranty, high temperature range, and quick start-up time. If we’re being completely honest, this product offers the most positive features in our Top 10 list, but has been ranked lower because of its extremely high price at over $1,400. In addition, despite its high cost, it only has 380 square inches of cooking space, which isn’t enough for large cookouts. Made of Terapex ceramic and stainless steel, this heavy-duty grill is the kind of unit that would last you a lifetime. Large Capacity and Scratch Resistance! This unit comes in a unique oval shape made of a ceramic coating with a lead-free glaze. Priced around $1,400, this grill allows for cooking on large scales across a wide area of space. Coming at $1300, this expensive yet massive grill impresses with its charcoal-based grill that can reach high temperatures of up to 700 degrees F. Constructed using porcelain and ceramic, this grill provides optimal insulation, giving you even and thorough cooking for all types of meat. Our team here at Grills Forever tried this grill and found that it satisfied 12 of our criteria, including ease of use and startup time. However, we thought that it was too pricey for its limited positive features, even if it came with a 20-year warranty. Compactly designed and lead-free, this grill is a good choice if you’re looking for something with great build. I know that one of the biggest concerns that I have about any review that I read online is wondering whether I can truly trust the results that I am reading. You don’t really know what qualifications that person has to be able to make a recommendation to you, and you may not be sure of whether they have been paid to make this review. That does happen a lot, which is a good reason why you should be skeptical. You also don’t know exactly why it is that someone has determined that one brand of a product is better than another. How are you supposed to make a decision that something is a better option, when you have no idea what it is that they used as their criteria to make this decision. Here is why you should trust Grills Forever. Over the past five years, my team and I have done an extensive search for the very best Kamado grill. 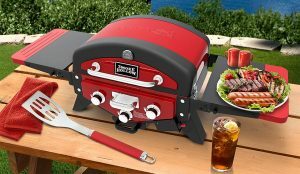 This includes examining reviews by consumers, reading blog posts and other posts on sites that have reviewed these grills, and actually comparing the features and benefits of each grill that were examined. Grills Forever is not affiliated with any particular company which helps us to come up with unbiased reviews solely based on what we found when testing a product and what existing customers of those products told about them. It is not just in the way that they look that separates the kamado grill from other forms of grills and is why you want to look for the best kamado grill for that night out. What really helps to make this a very useful cooking vessel for the vast majority of people who use it is the fact that it provides a uniform heat throughout the grill. What also separates the kamado grill from most other types of barbecue grills is the variety of foods that can be cooked in this vessel. The versatility is one of the biggest selling points of this grill, and is why it has become so popular over thousands of years. Of course, taste is a primary reason as well. These ceramic grills provide such an incredible flavor for your grilled food, giving you such tastes as oak, hickory, or maple. They are also ideal for smoking meats. One thing that we really liked about them is the temperature range. We were able to reach temperatures of up to 750° in some of these smokers, and the startup time takes less than 15 minutes, where a standard charcoal grill can take up to 30. That you are able to maintain lower temperatures, as low as 225°, for up to 12 hours for optimal smoking, or reach high temperatures of 750°, and maintain those for a long period of time makes these kamado grills a true winner. Not only can the best kamado style grill be used for growing, but for smoking, and has been used to cook a diversified group of foods, including meats, breads, pizza, and much more. Because of the way that heat is retained within the ceramic shell, it has made this kind of cooking vessel extremely popular with chefs the world over. If you are like me, then you want to ensure that the grill that you buy is one that will enable you to be able to make the very best food while also finding the best kamado grill. One that will make the flavors dance off of the meat or vegetables, and add just the right hint of smoke to it. Honestly, when I first started to get into grilling I wasn’t exactly sure what it was that I was looking for in terms of helping me to decide upon the best kamado grill. So here are some things that you want to consider when choosing the right one of these smoker grills for yourself. Like any grill, you want to ensure that you have adequate space to be able to cook your food are there are a variety of kamado grill sizes available. If you are a person who is normally cooking for just yourself and your spouse, then a standard 9.5 inches may be all that you really need. However, if you are expecting to be doing a lot of parties and other festivities, then getting a larger sized grill, something that is at least 24 inches may be what you need. Understand that there are a lot of sizes in between for the top kamado grills, so there are choices based upon what you truly need. Another measurement that you need to consider is the space between the grill area where you place your food in the top of the lid. A larger space will mean that more smoke is kept inside the grill while it is cooking. If you prefer a lot smoke your flavor with your food, then this is clearly the choice for you. However, if you like a hint of smoke flavor, then you may want to look at reduced distances. The materials that are used to make the grill also plays a role in your purchase. Some are made of ceramic, others made of metals, it is simply a matter of what looks and feels right for you. You are going to find in the larger size grills that these are quite often made with steel grates and an aluminum base. However, the smaller sized ones are a lot of times made with ceramic as the enclosure, giving you the option of the small ceramic grill or even the mini ceramic grill. 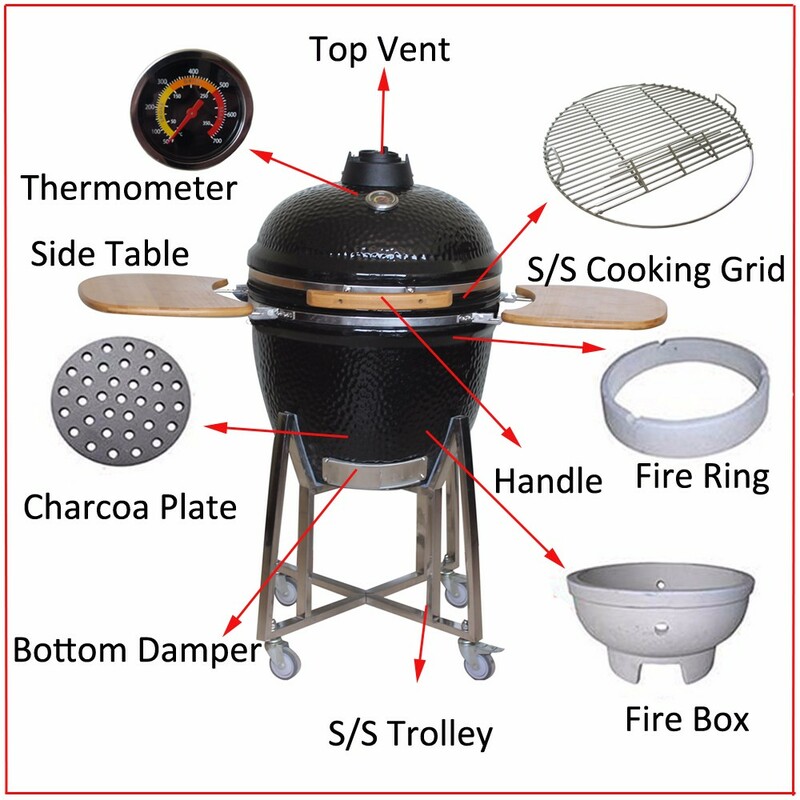 Many of these kamado smoker grills come with accessories that you may find are ideal for what you were looking for. This can include such things as the grill coming on a cart that includes wheels, side shelves, extra racks to increase the amount of cooking area you have, and a grill cover. 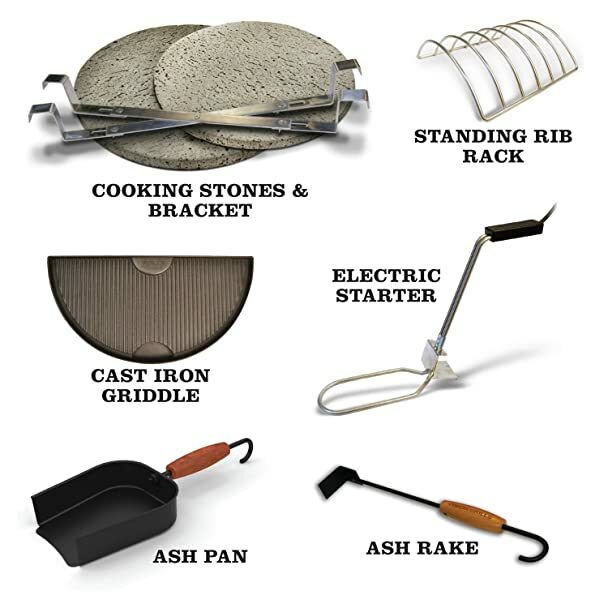 In some options, there is also a tool that is added that helps to clean the great and remove ash from the grill. 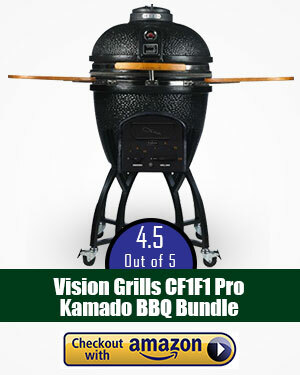 The Kamado grill prices are obviously a concern for many and you want to ensure that you get the best kamado grill. Depending upon what the kamado grill offers in terms of accessories, design, and space, you can find that these can range anywhere from $30 all the way up to $500 or more. It is really just a matter of what you can afford to pay. There are really two reasons why the oval shape is becoming a lot more popular with outdoor chefs. The first is that it makes the heating a lot more efficient. What is found is that this keeps the smoke and heat circulating better, providing a better taste and making it so that the food cooks a lot more efficiently. In addition, these types of grills make it a lot easier to access the food. Because of the design, it is easier to reach food, even toward the center of the grill, without having to worry about the heat making it uncomfortable for you. The fact is that if you know someone who likes to do a lot of outdoor cooking, then this is the grill that will make life a whole lot easier. Not only does this grill provide an outstanding taste, but they are so versatile that they allow a person to cook all different types of food on the grill, and this is why people are looking for great kamado grills for sale. If you get yourself a smoker with an electric starter and auto auger control then you will find that these functions really will make your experience in using the grill and your life, in general, a whole lot easier and more enjoyable. Competitors – If you’d like to get into competitions, where you are not allowed to use an electric or gas smoker, you will still find that you are allowed to use functions that allow you to control temperature. This could really help to make you a winner. Beginners – If you are a relatively novice to using a smoker grill, you were going to find that in virtually no time at all you are going to be able to create fantastic meals using one of these grills. It will give you everything that you’re looking for and taste, despite the fact that you may not have the greatest amount of experience in using a grill such as this. Plus, the easy ability to get started will keep you from getting frustrated waiting for your charcoal to get going. Professionals – If you are a professional cooker, or someone who has a lot of experience, then you will find that these kamado smoker grills are exactly what you were looking for. It can turn an average meal into a truly spectacular one, as you not only get the unbelievable flavor and succulent food, but you were able to control the temperature to great precision making your meal exactly the way you wanted to be. 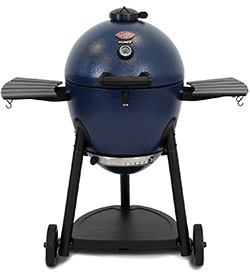 Those on the Go – If you enjoy traveling a lot and enjoy camping or other outdoor activities, you will find that many of these smoker grills are made with portability in mind. This allows you to take this grill anywhere you go, whether it be to a park, campsite, or even to the jungle. Geeks – There are those who enjoy any kind of tech functionality that they can get, and you will find that these grills offer you that kind of control. Some even allow you to hook into your smartphone so you can monitor the temperature of the food while it is cooking. Innovation truly is remarkable! Green People – There are many out there who are concerned about protecting the environment. Because these grills are more efficient and use significantly smaller amounts of fuel to cook, they offer a much cleaner and safer option for the environment. Really, if you think about it, this grill is absolutely perfect for anyone who enjoys a fantastic tasting meal. Over 20 different grills were reviewed, according to an extensive set of criteria. These criteria include such things as build quality, cooking area, heat retention, price, accessories offered, the time needed to get grill started, ease-of-use, customer satisfaction with the product, among others. This should give you a very clear picture of what is the best option for you. This includes the materials used to create the grill and its outer casing, including such things as legs and wheels. The price factor is determined by finding the median price of the 20+ grills that we examined, and then giving a positive to those that were under the median price and a negative to those that are over. Using the same principle as the price factor, the cooking area includes the actual amount of space where food can be cooked and warmed. This is done in consideration to the overall size of the grill and in comparison to that of grills of similar size. This factor includes the low and high temperatures that can be achieved inside the grill, including the ability of the user to be able to control grill temperatures manually. Heat retention also includes installation as well as materials used to create the grill, which aids in maintaining the heat for a longer duration of time. Start up time is the amount of time it takes for the grill to start and be ready to use. This is also determined in comparison to the median of the grills that were tested and reviewed, with a positive being given to those that took less time than the median time. Accessories include a large number of additives that can be included, such as advanced multi-panel firebox, divide and conquer flexible cooking system, recipe cookbook, drip pan, among others. This factor not only relates to the ease at which the grill allows customers to be able to start the grill and cook food, but also relates to how easy it is to move the grill, does it come with wheels making it easier to move, ease of storage, and ability to start up and maintain cooking temperatures. With an idea of what kind of things to consider when choosing a grill, now it is important in this kamado grill review that you get an idea of what are the very best grills to choose. Before doing so, it is important to note that a lot of research has been conducted in order for our top 10 list to have been created. We have analyzed 49 most important features for each of the product we have selected. This product does not contain the maximum number of positive features, however, it holds a unique combination of the most effective and positive features, including triple walled insulation with locking lid and a meat temp probe. There is also an adjustable damper at the top which helps airflow, with a bottom damper using which you could control the heat going through the heat gauge. All of this makes it the best kamado smoker according to the standards we have used. You will marvel at the quality, versatility, and beauty of this kamado cooker. 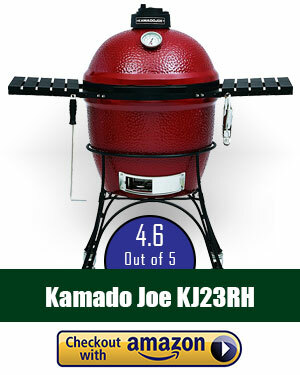 This kamado smoker has a large 314 square inch major cooking space and a warming rack that is 133 sq. in. for total 447 sq. in. The surface of cooking space is made of cast iron, while the body is made of 22-gauge steel. The exterior is made of a coated steel powder, while the interior that is coated with porcelain. This smoker also has two eight-inch wheels in the front as well as a caster wheel in the rear that locks which makes its portability ideal. This product is designed and built to last but priced to fit anyone’s budget. 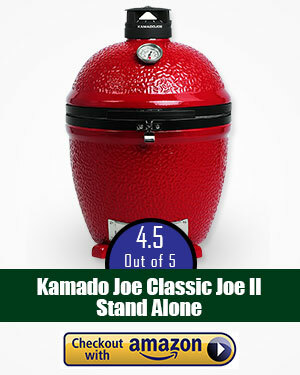 It contains the lowest price as well as a lot of effective features among all the kamado smokers we have tasted. This grill and smoker is versatile and durable due to a steel construction, which will allow prolonged cooking temperatures up to 700 degrees F. Added together, with the price involved, and it is easy to see how this is the best kamado grill that one can find. This is the best kamado grill not only in this category but also of other Char-Griller grills because it provides 314 square inches of space that is available for cooking, plus an additional 133 in.² but is available for warming. It is made of an insulating material that allows you to use less charcoal while reducing the amount of airflow that can reduce heat as well. The cooking surface is made of cast-iron, and the body is made of 22-gauge steel. The exterior has a coded steel finish while the interior is coated with a porcelain steel. Extremely durable. The price for this grill comes in at about $309, putting it below the median average. For the value that this provides, that is a pretty exceptional deal. The cooking area provided is 314 in.² of space for cooking. There is also a 133 in.² area that is available for you to warm food while the main area is still being used. The total of 447 in.² was the fifth highest in our top 10. The heat that was attained ranged from 200° to 700°F, and because of the ceramic coated interior, he was able to maintain the temperature for an extended period of time, this is also attained because of the triple wall insulation that is provided, one of two kamado grills that provides this option. Because of the design and installation, this was found to be one of the quickest startup times available. 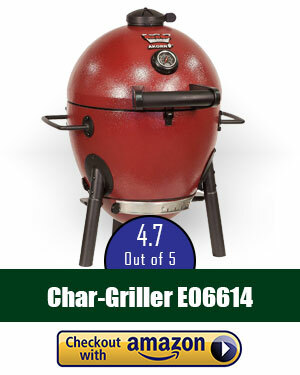 You will also find that it is fuel-efficient, and require significantly less charcoal than many of the other grills available. The accessories that are included are quite limited, making this the greatest negative related to the grill. It is a very versatile grill in terms of the kinds of foods that you are able to cook on it, and comes with a cast-iron chimney vent which is ideal in terms of getting a great quality taste. Because of the design and the way that heat is distributed, this is one of the easiest smokers you will find on the market today. The easy-to-read thermometer allows you to adjust the temperature easily and evenly, and it is extremely easy to clean as well. 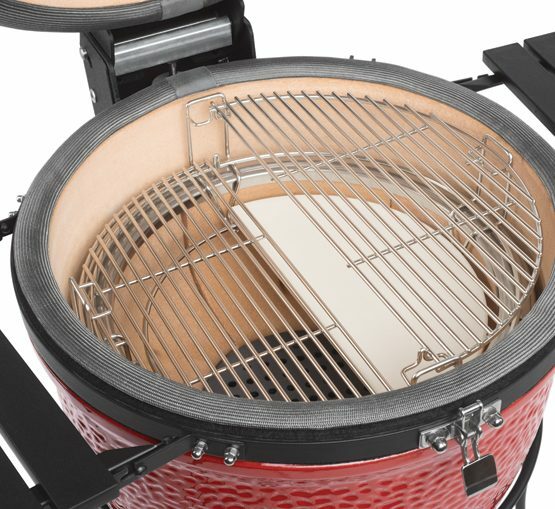 All these features prove why this is the best kamado grill in our list. A large number of positive features. Great price for the value you are receiving. Does not use an insulated design. Why Is This Our Runner Up Pick? 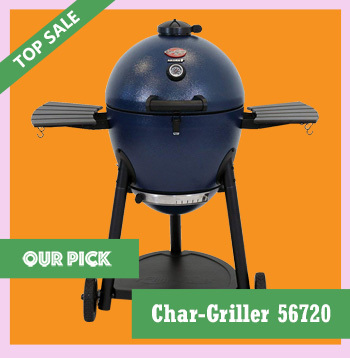 This is one of the best ceramic grills for sale that Grills Forever noticed when we were reviewing Pit Boss grills and has also earned high marks with 17 positive features, such as a cast iron top damper, dual tier cooking grates, easy-to-read thermometer, and folding side shelves. But two factors kept it from becoming our top choice – its price and the number of customer reviews it received at the time of this writing. Otherwise, there is a great deal to like about this grill, including the amount of cooking area that is available, as well as the number of accessories that are included. The Pit Boss is an all-in-one Charcoal cooker that allows you to cook just about anything. This kamado grill is built with a ceramic body that is perfect in terms of helping you to efficiently burn coal to keep optimal temperatures. The top is made of cast-iron and is built to give you complete control over airflow. The side shelves are made of a solid bamboo, and are sturdy and able to close down for easier storage. This is one of the more expensive grills that you will find, coming in at about $715. This price kept it out of the top five in terms of price, but its value makes it at least worth taking a closer look at. If you do have this amount of money, you will find that this is one of the very best grills available, and the fact that it offers you a large cooking space makes it a winner. The cooking space for this ceramic smoker comes in at 567 in.², all of which can be used as a cooking space or as a warming area. This amount of space ranked it within the top five. The grill could handle up to 700° F, and came with adjustable top and bottom dampers, a locking lid, and a heat gauge to help you to be able to get the optimal temperature you are looking for. Because of the design of this grill, including using a ceramic body, you will find that your charcoal burns quite efficiently. Startup time is dependent upon how efficient you are at burning charcoal. Additional accessories included with this grill are such things as a locking lid, locking dampers, and easy to dump ash pan, a folding side shelf, among others. It is the large number of accessories that made this a top three pick for us. This is not a lightweight grill, making it a little less friendly in terms of portability. It does come with wheels, making it a little easier for you to be able to move it when needed. It is quite easy to use if you are a person who can is adept at using a charcoal based grill. A large amount of cooking space available. Use of ceramic material helps to insulate well. Quite expensive in comparison to the top choice. Developing your grilling skills can take some time, and using a more sophisticated kamado grill can be a little more challenging. That is why this Akorn Jr. is the perfect choice for those who are trying to get their feet wet and find something that still gives you a lot of value for your money. It not only comes at the second lowest price in our top 10, but comes with 15 positive features, as well as the second-highest number of positive reviews. This is an outstanding lightweight grill, and is perfect for those who are just getting into the kamado smoker grills, especially considering that it gives you such great control to provide a precise temperature, and comes with a triple wall steel to provide great insulation to help those temperatures be maintained. This grill is made with cast iron grates, and has a ceramic base that is a lot lighter than most traditional ceramic grills. It does not come with wheels, but it is designed to easily pick up and be able to move as needed. Priced at about $320, this is a fantastic grill for the money you will spend. While it doesn’t come with some of the amenities that many like, and provides a smaller cooking space, it is still a bargain for how well it retains heat and cooks foods within the griller. The cooking area to this ceramic kamado grill is only 153 in.², the mini version in our review, and it provides no separate warming area. In fact, because of the size of the grill, it is more difficult for you to be able to set food aside that is already done while other food items remain in the center to cook. Because of the insulation and ceramic used, you will get great heat retention in this cooker. Temperatures reach as high as 700°, in the locking lid and insulated design allow you to provide an even heating no matter where you have the food on the grill. The startup time is a snap, as discussed with a heat gauge that allows you to determine the exact amount of heat you desire, and with a press of the button your grill is ready to go. Additional accessories to this kamado smoker include such things as an easy dump ash pan, a lighter weight, a convenient handle, and a quick clean porcelain cooking grid. 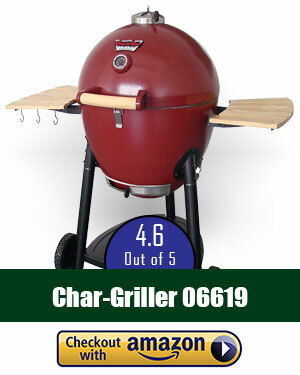 This is one of the easiest grills you will find to use, not only because it is very easy to assemble with 6 easy steps. It also allows you to easily turn on the grill at the push of a button. You can determine the amount of heat needed, and because of its design, the grill is extremely easy for you to be able to move. A true winner for anybody who is just starting to enjoy the benefits of the smoker grill. One of the lowest prices available and our review. Great features include such things as a locking lid and easy dump ash pan. Received the second highest rating in our survey. A small amount of cooking space available. Not the most durable and comparison to the others. 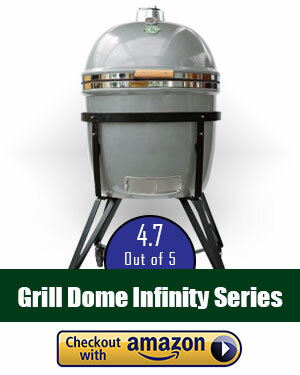 If you want the grill that provided the most positive features, then this Infinity series is the one for you. We actually found that it had 19 positives, including such unique as the Featherlite Hinge System, proprietary Terapex Ceramic blend for better thermal efficiency, Dial Top for precise smoke control, Dial Door for consistent airflow, and a lifetime warranty. But its price was the most of any in our top 10, which cost it a top spot. While this is a pricey option, the fact that it comes with 1.25 inch thick walls allows to heat retention to be better than most, and gives you temperature control from between 225° and 750°. Plus, it comes with a lifetime warranty on its ceramic parts. This is an extremely well-designed grill and one of the best kamado grill for the money, that provides one of the best thermal efficiencies you were going to find, primarily because of the Terapex ceramics that are employed. He uses a heavy duty stainless steel outer shell which is rust resistant, and the company backs their product with a lifetime warranty, which tells you a lot about the quality of this product. You can be sure because of its design and the materials that are used that this is actually the very best kamado grill in terms of efficiency and design. Where the smoker is hurt is in the price. It comes in at over $1400, but is well worth it if you can afford this. Because of the lifetime warranty, you can be sure that if you have any issue it will be replaced or fixed. The cooking area is 380 in.², which was a bit smaller than what we expected. For such a top-notch grill, it was surprising that more space is not available, or at least that they did not provide a warming area. Heat retention is easy to maintain with this grill, which allows you to set the temperature between 225°F and 750°F. Heat is maintained well by the incredible ceramic that is used, and this is the best grill in terms of heat efficiency. This grill is easy to start up, with a simple press of the button to get your fire going. There are a large number of accessories that you will enjoy with this grill, including locking casters, an easy dump ash pan, insulated design, five different color options, and a dial top and door. It was surprising that was such a quality design that a folding side shelf is not included. This is a beautifully designed grill, which is ready to use within 10 minutes of you taking out of the box. The grill itself easily comes out of the enclosure, which is on wheels making it easy to move and store. If you love to cook outdoors and can afford the cost, this is the choice for you. The best warranty of them all, with a lifetime warranty included on ceramics. Highest temperature range that is able to be maintained. The largest number of positive features included. The highest price of any in our review. There are those who when they are ready to grill, they are ready to do some serious cooking and know that any kind of mini space is not going to do the job for them. This is the option for those who like to host events or parties at your home where you need to do some serious cooking, as this is the largest total cooking space available, not only in overall space, but in primary cooking space as well, coming with over 680 in.² including the rack extensions. Also created with scratch resistant porcelain glaze, and is completely lead-free. A 20-year warranty is included. This grill uses a unique oval design, which actually helps to improve the flavor in taste. The exterior is made of a blend of ceramic coating with a lead-free resistant porcelain glaze. This is the second most expensive grill, coming in at about $1300 which is honestly a lot of money. If you are looking for a kamado grill that gives you a great deal of cooking area, then this is your choice, and you simply have to live with the expense. This grill provides 680 in.² of cooking space, including 400 in.² of primary cooking space. For those who are planning large festivities, you can be sure you have plenty of space to be able to deliver food with a quality taste. This is a Charcoal based grill, but is able to reach rather high temperatures, as high as 700°F. The combination of the porcelain and ceramic build help to insulate well, providing even heating throughout the grill space. The startup time is based upon how well you are able to get Charcoal going. You should consider that the larger amount of area means that it should take some additional time to get your coals heated equally. Accessories for this best kamado grill for the money include such things as a lid lock, a 20-year warranty, and an easy to read thermometer. There is also a soft-close felt gasket. for as much space as this grill provides, it is quite easy to use. It does take a little getting used to in terms of distributing food around properly and knowing when to move it to the warming area. A few tries and you’ll be satisfied with results. The largest cooking space available of the grills included in our review. A large number of positive reviews from consumers. A 20-year warranty on most parts. Rather pricey in terms of cost. This grill is compact, offering excellent portability. 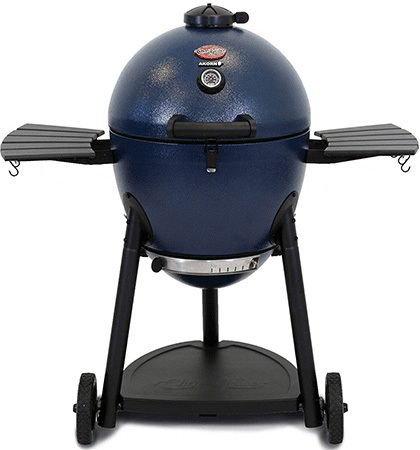 It is made of ceramic and has a sturdy wheel base to allow for on the fly grilling! This unit is priced around $900. The Kamado Joe is an excellent small kamado grill, but comes with very few features that distinguish itself from any of the others. It has 15 positive features to it, but has one of the smallest cooking areas of any of the grills we reviewed. It did have several positive reviews, but had an average number of them. Where it really separates itself is in the warranty. This grill is made of ceramic, which comes with a sturdy cart and a locking wheel system. Priced at about $900, this is a quality grill that hasn’t distinguish itself, but comes at a reasonable price in comparison to many of the other options we reviewed. The cooking area is 255 in.², putting it just outside the range of our top five grills. There is not a separate warming area. Heat can reach as high as 700°, and there is a heat gauge that will let you know the temperature inside the grill area. The ability to get your grill started is dependent upon how quickly you were able to get your charcoal going and prepared to cook. There are several accessories you will find that you like, including an easy dump ash pan, locking casters, folding side shelves on both sides of the grill, a sturdy frame with wheels, and a lifetime warranty on all ceramic parts. This is the very best warranty of all products we reviewed. Because of its design, this is a portable grill that is easy for you to be able to store. In addition, it is easy to use, as long as you are a person who is adept at using charcoal. A quality grill for sure. Comes with a lifetime warranty on the ceramic parts. Provides great ability to fine tune the temperature. Comes with the proprietary Terapex ceramic blend. Relatively small cooking area available in comparison to others. Quite a bit more expensive than most of the upper-end models. To Grill or to Roast? This grill has a unique and interesting design that allows for plenty of prep space. At an affordable price, this grill offers versatility, as you can both roast and grill your food! The Kamander grill has an interesting design that gives you a lot of preparation space because of the extended shelf to the one side of the grill. This is a quality grill that comes at an affordable price, and gives you both a primary cooking and warming space on the grill which makes it one of the best ceramic grills you will find. One thing you will really love about this grill is its versatility, which enables you to be able to grill or roast your food. This smoker is made with a double-walled steel construction and a large folding side shelf, that gives you plenty of space and a very durable grill. The steel construction provides a great deal of insulation, and helps to heat within the grill quickly, and maintain the heat once it is going. Priced at just under $400, this is a quality grill at an extremely reasonable price for the amount of money you are spending. You will really love the amount of space that it provides. The cooking area is 327 total square inches, with 142 in.² available for warming. This allows you to have a substantial area to cook on, while still being able to maintain the heat and keep other items warm. The heat generally reaches no more than about 650°F, but this grill is meant to maintain heat once it gets going, and the grill area will heat up quickly. In this kamado grill charcoal starts burning according to how good you are at getting the coals going. The accessories include a heat gauge, locking casters, and easy dump ash pan, and a huge folding side shelf, the largest of any on the market. There is also an easy-to-read thermometer and a cast-iron chimney vent. This would have been a better purchase had a warranty been available. Because of its design, this is one of the easier charcoal grills to be able to use. This is an easily portable grill, that comes with durable larger wheels, and a solid frame. Provides a primary and warming cooking areas. Made of a durable steel. A significant number of positive features. Steel makes this a lot harder to move. Priced around $450, this unit is pretty affordable. With a solid frame and cast-iron build, this unit is made to be heavy and sturdy. This grill is also very easy to use! While this grill appears on our list, it comes in with the least number of positive features included, with only nine assessed by us. It comes with a very simple design, and is incredibly easy to use, making it a charcoal smoker worth use. The materials used also make this a winner. 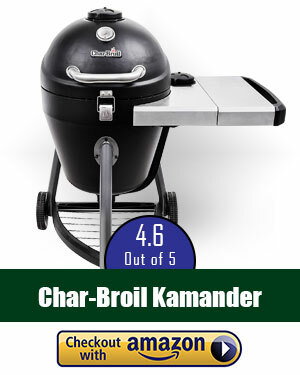 The fact that this is the third most highly reviewed kamado grill should tell you a lot about the fact that people like how good it is. This grill is made with cast-iron, making it a lot heavier to be able to move, but it comes with a solid frame and easy to roll wheels, which make it a quality build. You also like the fact that it is quite durable and free from rusting, as cast-iron would expected to be. The price for this grill comes in at about $425, a good price for something so durable, making this a real value. It does not come with a warranty, but that doesn’t look to be an issue because of the materials used in the design. The primary cooking area is 306 in.², and comes with a warming rack that provides another 165 in.² in a mini area. This is actually the fourth largest overall area of any of our top 10 cookers. Because of the use of cast-iron, heat is easily retained inside this grill. In fact, one thing that you should be leery of is the fact that the entire grill can get quite hot, meaning you should be careful to avoid coming into direct contact. Temperatures can easily reach as high as 700°F. Your ability to start up the grill is based upon how easy it is to get the charcoal going, however, the cast-iron design makes this grill an easy one to keep going once a get started. Accessories included with this kamado grill include a heat gauge, locking lead, and cooking grate. This is truly a no frills option if you ever saw one. There is no doubt that it is easy to use, and is portable despite the heavier materials that are used. The warming space makes this a great grill for cooking such things as steaks, where the level of cooking varies to the individual’s taste. Includes a primary cooking area and a sizable warming rack. Made of an incredibly durable cast-iron. One the largest number of positive reviews provided by consumers. Lowest number of positive features in our review. Cast-iron makes this extremely difficult to move. Designed as an Eco-friendly grill, this unit offers a wonderful design and a large cooking space. Priced around $900, this grill offers up a wheeled base for easy transportation! This Pro Kamado Grill is a fine choice for those who want an automatic starter to go along with a sharp look and a lot of cooking space. There were very few reviews related to this grill, but this should be your only indicator of its quality. There is a lot to like. Made with a quality ceramic construction, this is an outstanding design, specifically created as an eco-friendly coal consuming option. The construction eliminates contact burns, and the combination of metal and ceramic make this a very durable kamado grill. The price of this grill comes in at about $900, which is a pretty fair price considering the large cooking space that you have available. It doesn’t come with a lot of positive factors, but is still a pretty quality cooker. 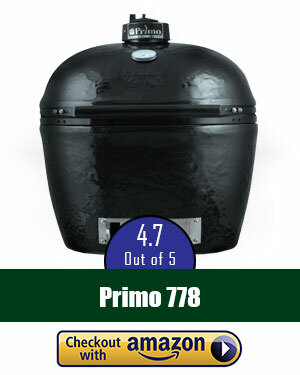 The cooking space is 596 in.², which is the second highest of any of the grills in our top 10. There is not a separate warming rack, and heat is distributed evenly. Because of the design and the use of ceramic, this grill heats up quickly and retains heat to between 200°F and 700°F, depending upon the amount of charcoal and other factors. A great cooker, the comes with a heat gauge and top and bottom dampers to help you to control the heat level within the cooker. Easy to start up, as you are provided an electric starter as part of your accessories. Additional accessories include locking casters, easy dump ash pan, folding side shelf on both sides of the grill, and a lifetime warranty on the ceramic parts and a five-year warranty on the metal. This is not a particularly easy grill to put together, but is easy to use once assembled. Also comes on wheels to provide portability. Large cooking area of almost 600 in.². Features make this easily portable. Lifetime warranty on all ceramic parts. One of the more expensive options in our review. A minimal number of positive reviews given. This grill is standalone and is built out of materials that allow it to be left outside. This unit is meant for high temps, going as high as 750°F. The unit is light and easy to use! This is the least reviewed kamado grill that was reviewed by Grills Forever, as only two positive reviews were provided on Amazon. You shouldn’t take this as an indication that this is a bad grill, however. There is a lot to like about this grill, and it is also a good option for those who were looking for a standalone grill this ideal to use in a multitude of circumstances. This is a standalone grill, that is made of all aluminum, rust-and rain-proof materials, making it ideal for leaving outside. The match is made of a fiberglass gasket and this is a durable cooker. Priced at about $1000, that seems a bit high, but the fact that it was tied for the highest number of positive features tells you that this is a quality purchase. The cooking area is 500 in.², but only about half of that is used as a primary cooking space. 252 in.² are used as a warming rack, in this comes with a divide and conquer flexible cooking system, with multi-levels. This is no mini grill, as it gives a lot of room to get your food prepared. Temperatures range from 225°F, to 750°F, giving you one of the highest ranges of heat available within the kamado grills that have been reviewed. Heat is easily maintained within the cooker, because of the insulation and materials used. The startup time is based on your ability to get your charcoal going, but is much easier to get going in this cooker because of its design. Accessories include such thing as an easy dump ash pan, folding side shelf on both sides of the grill, easy to read thermometer, cast-iron chimney vent, and I reversible cooking grate. This was also the only cooker that provided an advanced multi-panel firebox and a stainless steel latch. A very easy-to-use cooker, which takes some work to assemble and is not on wheels. This would make it seem that it is not portable, but the lightweight materials used makes it so that it is not cumbersome to pick up and move. Tied for the largest number of positive features in our survey. Earned the highest average rating. Quite expensive at just under $1000. Only two positive reviews provided by consumers. Should You Upgrade Your Kamado Smoker? This is really a question that is based solely on need. If you are finding that your current grill is doing a fantastic job for you and is giving you the kind of performance you are looking for, then there is really no reason for you to change. However, I have found that an upgrade is always needed when I have found that my needs have changed. It’s like when you know that you have another child on the way, and you start looking for a new car. If you are planning on having additional advance at your home or simply feel that you would like a grill that gives you greater versatility, then it’s time to look at an upgrade. Like any grill, if you want your kamado grill to last, you need to do the kind of things that will care for it. Some of the parts on the grills that the Grills Forever team has reviewed include metal, which means that you need to protect them from the elements, or they can become rusted. There are some options that come with rustproof metals, such as those Big Green Egg BBQs, removing your concern for this kind of deterioration. You want to make sure that you clean all cooking surfaces on a regular basis, especially just before cooking food. Many decide that simply letting the flames burn away the material on the grill is good enough, but this can still leave a residue and bacteria that can be harmful to you. It is best to clean with an approved cleanser, and thoroughly rinse to ensure that no cleaner remains. When not in use, store your grill in a location that keeps it free from being damaged, and also out of the elements. You want the most value for your product, and taking a risk by leaving it out in a storm can lead to damage and a need to replace it. This is not a good use of your money. We live in an age where people need to stretch every dollar they get, meaning that they need the maximum value available to them. This review clearly gives you great options, and a reason why you should turn to one of these grills. If you are a person who enjoys cooking outdoors, you need to find the best kamado grill. Many even afford you the opportunity to take the grill with you should you go camping or to some other kind of excursion. For thousands of years, people have been cooking outdoors using a form of the Kamado grill. And you probably also know a charcoal grill is healthier than its gas counterpart. Now, you can use today’s version to give you the very best cooking experience and make every meal something special.